Showcased is a marvelous young lady’s Victorian ball dress. The French silk evening gown features short tight sleeves ornamented with puffs, lace and silk ribbon — characteristic of the mid-1840s. The exquisite Victorian fabric is a rose pink moiré silk patterned with blossoms and leaves. 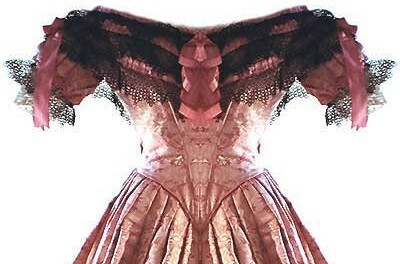 Lavish Victorian gowns exhibit explores the aesthetics of 19th-century clothing design. The millinery business was one of the few respectable occupations available to women.